The latest update adds the ability to quickly view Project/Category Tasks and appointments in the Summary Dashboard. For full review and management of Projects, the Detail Dashboard is more powerful and capable. However, for a quick review of status or to-dos, these new quick access modes offer a easy and lightweight way to view Project/Category items. The first quick access mode is through a filter button added to the top list of Projects and Categories. Hovering the mouse over an item in the upper list will display a filter button, which when pressed will filter the list of lower list of Tasks and Appointments. Clicking on the X button or the same filter button again will revert back to the normal view. The second mode is a new Follow Folder view available in the lower item list. When this option is selected, the list will automatically filter to the Project associated with the current folder viewed in Outlook. 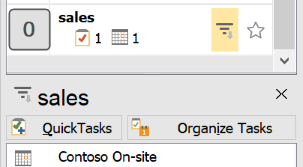 For example, if the folder “sales” is being viewed in Outlook, the list will show only Tasks and Appointments for the “sales” Project, and the header will reflect that status. If the current folder is not associated with a Project, such as the Inbox, then the list will revert to showing all items. This update is rolling out to users on the Beta or Fast update option (this option is accessible in the ClearContext Account screen in Outlook), and will be rolling out to all users shortly. Posted by ClearContext at 7:46 am on October 27th, 2017. A new update has been released that adds search and navigation capabilities to the new Project Dashboard. The arrow buttons navigate the Project or Category list displayed in the Summary Dashboard, while the Project/Category button allows navigation to any Project/Category Detail. Typing text into the search field will filter all items in the Dashboard Detail window, searching on fields for each item. Depending on the item type, the subject, name, email, Project and/or the category fields may be searched. Posted by ClearContext at 8:47 am on October 10th, 2017.